Earlier this evening, the happy sounds of fourteen girls echoed through the ravine behind my house. The bravest of the bunch, eight or ten, waded into the creek, while the rest played in our treehouse, climbing the rope ladder, swooshing down the slide, watching us from their vantage point on the hill. We squished our toes into the mud and splashed in the warm water. We climbed over some of the trees that bridge the water, crawled under the higher ones. In some places, the mud feels like quicksand, and I felt my legs sink in almost to my knees. We wandered upstream until we reached an impassable spot. Then we retraced our steps and walked downstream past our starting point until we got to an obstruction — fallen branches crisscrossing the creek. Two girls ducked ahead to scout out the path forward and declared it to be far too treacherous to continue. I said to my friend, while we sprayed off the girls’ muddy feet with the hose: I’ve waited all summer for this. The creek is right in my backyard. This fall, when the leaves are stripped from the tree, I’ll be able to see it from my office window. I don’t have to walk far to get there. Out the back door, down the steps, to the water’s edge. 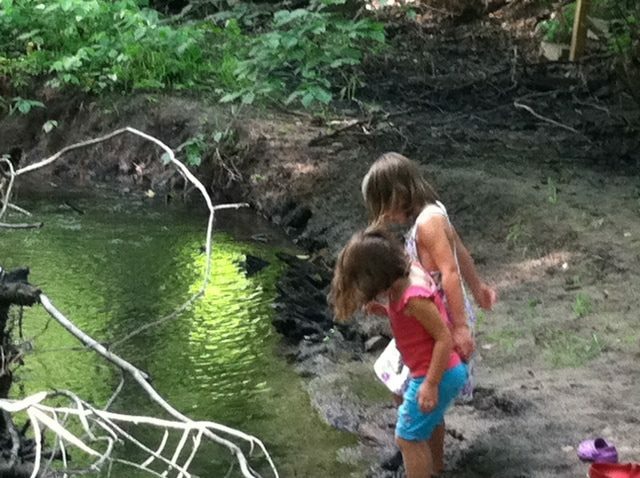 My girls often ask if we can play in the creek. My answers: it’s too muddy; maybe later; too many mosquitoes; I’m working now; it’s bedtime; not tonight. Somehow, I needed this group of adventurers to propel me past my excuses. And what a group of adventurers they were! Undeterred by mud, they forged on, sure-footed, reaching out a hand to pull up a friend, their eyes alert to crabs, minnows, frogs, and flies. I waited all summer for this. What have you been waiting all summer to do? What are your excuses? What would motivate you to put those excuses aside? Invite someone else to join you if you must, but do that fun thing you’ve been waiting all summer to do. Break out of your usual routine. Do it tonight. Make some memories. Tell me something! If my post inspired you to do something, I’d love to hear about it! 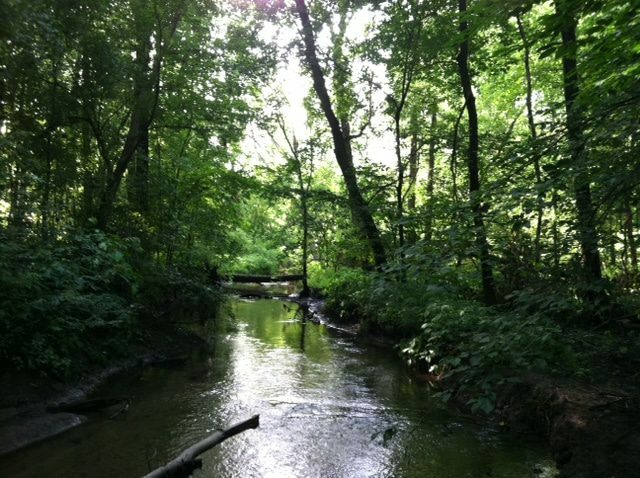 The time spent in a creek makes all the getting clean, going to school, staying dry worth it because you can go back in your mind for the rest of your life. Mud squeezing up between your toes won’t happen at the prom or a movie theater. You helped me make up my mind to have an adventure. Thanks! Cool. Thanks for taking the time to comment here. I’d love to hear about your adventure when it’s done. Why? We wait for the same reason your girls do – for somebody else to give us permission. It is a pattern that repeats and repeats until we forget why we wait. We are grown-up now (or at the very least older) and we don’t need permission – we just need to be reminded. Thank you for being a reminder. Glad to provide a reminder for you. It’s a good lesson for me, as well. I hope whatever you were waiting to do turns out to be wonderful when you do it! We wait because we are taught that now is not the “right time”. Everyone I’ve ever come across says something very similar. There is guilt attached to the doing – if I do it, I’m not doing something else and the something else I “should be” doing needs to get done. The fact is that letting go of that and just allowing ourselves to step into those moments offers freedom for our kids, but most importantly, freedom for ourselves. Good for you for stepping into the non-waiting and just doing! But still living life, wouldn’t you say? Now, I want to have a bonfire! How about you come over soon and we can splash in the creek and have a fire, too? Thanks for reading and commenting, Keri! Perhaps. I have bandannas — lots of them. :-). Do you have swords?